Keeping the meal plan simple seems to be the key to sticking to it...at least for the summer months. This week's meal plan has been created in that same vein, and I'm hoping for the same results as last week. This weekend we are heading to Avalon, New Jersey to visit friends, and on Sunday, we will be traveling from Avalon to North Jersey for a graduation party, so the meal plan is abbreviated this week. Plus, I picked up the latest edition of Woman's Day magazine at the grocery store this week, and there was lots of meal time inspiration in there. 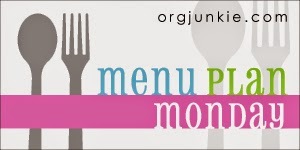 Every item on my menu this week can be found online or in the August 2014 printed copy.